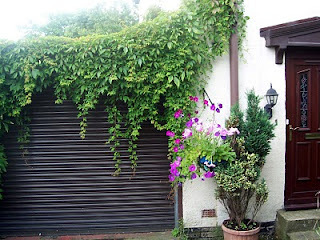 Some are saying it has been a poor summer but I think it has been pretty good, considering the awful winter we endured. But all good things come to an end and although I hate to see summer passing, it has to happen eventually and already I've noted those tell-tale signs! Nature has grown in abundance until it can grow no more. It has reached its full potential and is looking for rest. 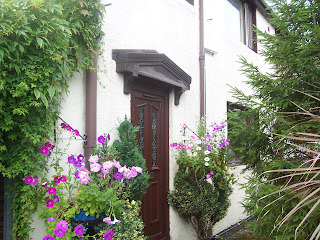 The petunias in the hanging baskets are beginning to look tired and the Virginia Creeper, heavy now in leaf is showing signs of turning red. Its autumn colours gradually creeping in. I love to see the tumble of leafy tendril led vines reaching to the ground. It makes a lovely softening frame to what is otherwise quite a boring garage door. Our back garden is so overgrown it could be termed 'wild'. We don't have the stamina anymore for heavy gardening so I'm hoping that a good fairy will come along and help us out before next summer. Nonetheless, 'him outdoors' has managed to grow salads, beans and tomatoes along with perennial strawberries, redcurrants, raspberries, plums, cherries and apples. This summer we treated ourselves to a blueberry shrub which should add to our fruit harvest next year. Although varied, the harvest has not been more than we could eat except perhaps for the redcurrants. My sister managed to pick 5 lbs of them which she made into jelly for fundraising. 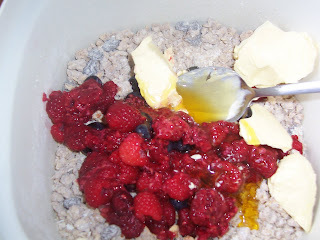 I in turn added raspberries and blueberries to flapjack mixture for grand kids. 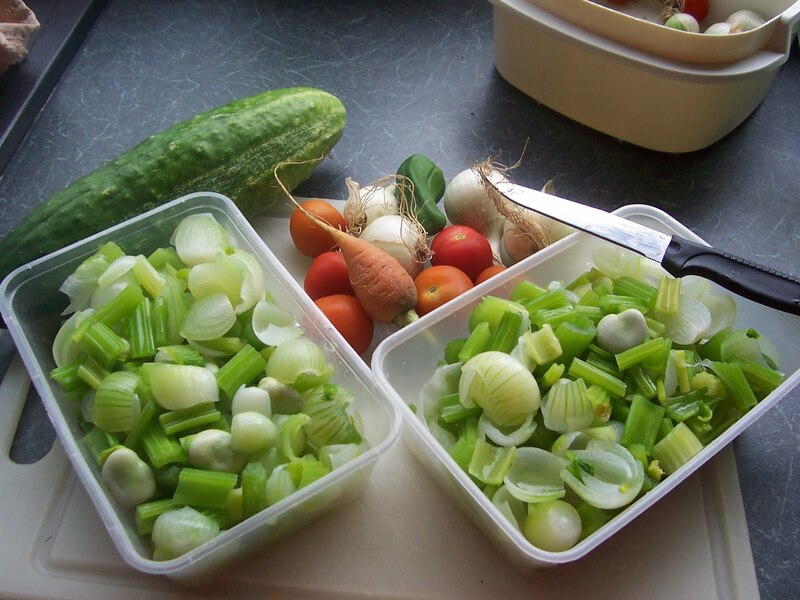 Celery and shallots, peas and beans were mixed in small quantities as casserole or stir fry mixes and frozen. Tomatoes were cooked with onion and peppers to make sauce for pasta or as a coating sauce for chicken, pork etc. 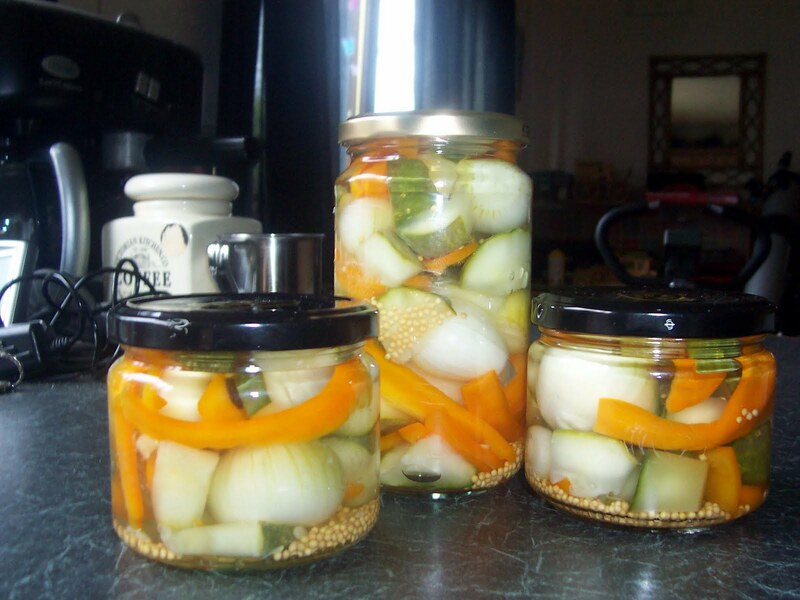 Glass jars with button lids are ideal containers for storing sauces. Sterilised jars are filled with hot sauce mix and sealed. A vacuum forms inside the jars and the button depresses with a pop. So far I have found this method very reliable. We had a good crop of cucumbers, which were delicious! Some of the surplus were given away or pickled along with onions and peppers. I have kept a few jars of mixed pickles back for Christmas and will use them as Christmas presents. Heavens above! I've used the word Christmas and its still summer...just! I have enjoyed being creative with garden produce this year. Still to come are plums and apples. I will let 'him out doors' make cider with the apples or leave them for our Fieldfare visitor if it comes back this year. Meanwhile, I need to look for a good recipe using plums...in abundance. A few years ago I created a pressed flower picture and called it 'Summer Passing'. The original is in Southampton but I have kept a framed print, which is now hanging on my wall. 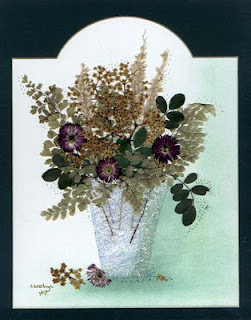 This is so pretty.I like the background, and love the vase.